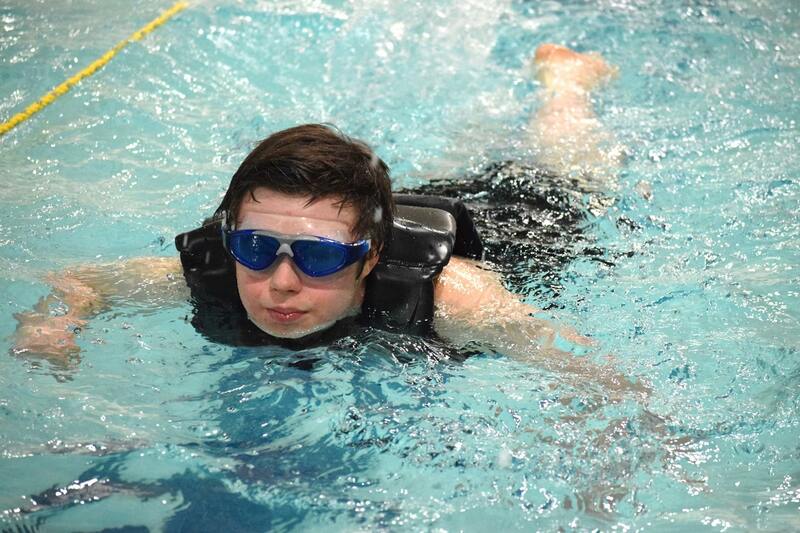 When I thought about doing special Olympics swimming with my son, I really wasn’t sure if it work for him. I had no idea how he would react in such a loud, stressful situation. I’ve seen him fly over nursing desks at doctors offices, dart out of medical buildings into parking lots, wrestle the dentist on the office floor. I’ve seen him glue himself into his wheelchair, becoming more and more obstinate until there is a glaze over his eyes and words of reason are interpreted as a “blah, blah blah” that makes no sense to his closed ears. There have been times when he has gone into shut down inside a public restroom unmovable for an hour or sometimes two until he could collect himself and get the nerve to leave the “safety” of quiet. I confess, I was apprehensive at what he would do at each practice — could I even get him up and out the door that early on a Saturday morning? Could I get him to leave the pool when class was over? Would he try to touch people? Would he do what was expected of him, or insist on turning somersaults underwater? But how he surprised me! Armed with my young living vetiver oil, he took to the class each week like he was the easiest kid in the world! I was unsure how long it would last; it was loud, full of swimmers and he had to swim laps-many laps! But it was a safe, friendly, inviting fun environment with wonderful coaches and volunteers. He now counts down to his favorite day of the week: SWIMMING DAY! But when it came time for the special Olympics competition, I was faced with new ” what ifs”. I just wasn’t sure how he would do; a new place, new pool– lots of waiting….where would I dress him?, where would I take him to pee? Would he understand what was going on? Would he decide not to get into the pool, would he decide not to get out? What if he decided he had to pee while he was in the pool, or worse….poop? But once again, armed with vetiver oil and cederwood, his favorite toy: Fozzie Bear, and an iPod-we ventured to our first ever Special Olympics competition. He stayed there half the day; he competed in three events, two in the small pool and one in the big pool. He didn’t cover his ears, he didn’t panic, he didn’t get obstinate and he didn’t go into shut down in the bathroom. He made it to the toilet on time, he seemed engaged, he was so happy, excited to be a part of something that made him feel special and he was surrounded with friendly volunteers and his coaches gave him amazing support. The whole experience was truly amazing! And although he did finally meet his limit and went into shutdown before we left, he made it through what he had gone there to do. What he DID was an amazing feat and I know and understand better than ever, just what an invaluable opportunity Special Olympics really is. I am forever grateful for the experience for him and for the wonderful volunteers that make it happen. I guess his momma did too!